What if your life depended on the attention span of a teenage boy? Paddy Lee, a spoiled sleepwalker, mopes about in a backwater town. But then the soul-gorging Blackgum lay siege and begin to pick off his schoolmates and loved ones. Only an irritable moth-mage and Platto - his attack-semi-smartphone - will stand with Paddy to oppose oblivion. And the Blackgum strikes aren't random. To save his family and his town, the distracted daydreamer must concentrate long enough to unmask and confront the most fearsome monster of all: the Zealtor. For Paddy Lee is a Scattersmith. Though he'd rather wait for his life story to stream on Netflix. A plot-driven tale told with wit, the novel features an unstable world of Forgers (creators/discoverers), Ferine (wild beasts/plants), Passengers (couch potato-drones), Witches (priests of lapsed gods), Helpers (object-spirits), and an eccentric supporting cast, including a gluttonous French horn, a multi-headbanging Giant, a guard budgie, a lovesick pinball machine, a school of psychotic piranha-stamps, a poltergeist-puddle, a plesiosaur, Manticore twins and a bullmop. 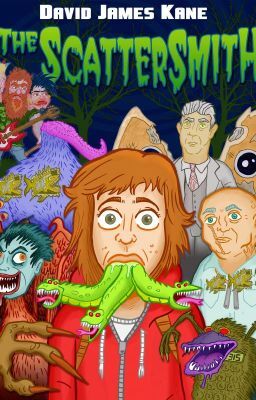 If you like Darren Shan, Derek Landy, Eoin Colfer and Daniel Handler, check out The Scattersmith.